Anyone still suffering with the cold weather out there? I am continuing to see snowy scenes from some parts of the globe, so I thought today’s card might warm you up a little. 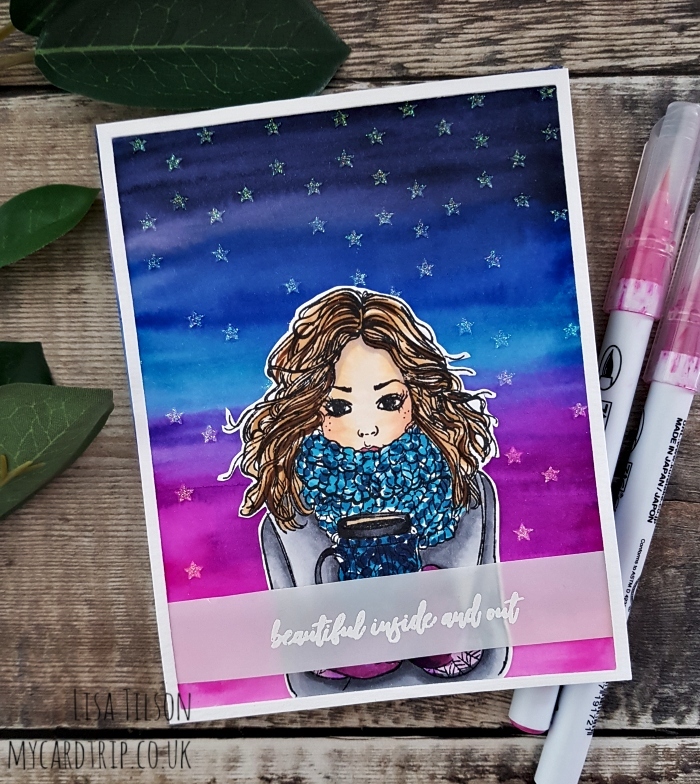 Today, I am featuring the absolutely gorgeous Jill Girl stamp from Picket Fence Studios. I was lucky enough to be contacted again recently by Picket Fence Studios who very kindly asked me if I would like to play with some more of their products. So I chose some images and I’ll be sharing those cards with you over the coming weeks/months. I truly believe that Picket Fence offer something a little bit different, and unique and I think that’s a great thing. So, here is today’s card for you. The image is called Jill Girl and she is one of many girls you can get in their Beautiful Girls range which I think is fabulous so I would encourage you to take a look at it. I wondered whether I could “Springify” her a little to make her more appropriate for a post at this time of year, but with that hot cup of coffee and big scarf and mittens, I thought she should definitely have a wintery back drop. I took a bunch of Zigs and literally scribbled lines across my panel of Strathmore Bristol Smooth. I list the Zig colours below if you are interested. Next I took a 0.5″ flat brush and added some water to move the pigment around, let it dry and then went over it again, blending between the colours as I went. You have to be careful not to go too mad with the water as it will pill the cardstock but I managed to get away with it and I like the unevenness of the colour. Once dry, I took my SSS Falling Stars stencil and a palette knife and applied Moonstone Nuvo Glimmer Paste through it. I then set it aside to fully dry. Jill was stamped onto Neenah with Memento Tuxedo Black and I coloured her with Copics. I have started using Neenah 110lb for my colouring now – it definitely helps with less bleeding, so I think I will stick with that going forward. 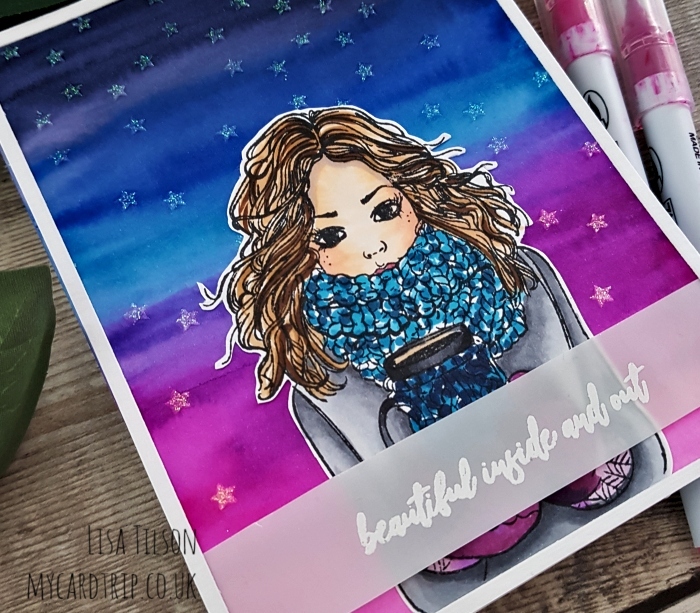 For her scarf, to try and get the look of texture, I just added dots of 5 different Copic colours and I think it worked out well so I did a similar thing on the knitted coffee cup warmer but with slightly darker colours. I fussy cut her out but you can get a coordinating die and then I went back to finish the rest of the card. The sentiment is from Picket Fence Rose Bouquet and I white heat embossed this onto vellum. You need to use an anti static bag as always before stamping the image and make sure your heat gun is really hot or you may warp the vellum. I also die cut a thin white frame from my HA Rectangle Infinity Dies. The Zig panel was adhered onto a 110lb base card with DST and the girl adhered with Studio Katia glue. Then I wrapped the vellum around the panel and secured it at the back with a little glue. To finish the card, I added wet adhesive onto the frame and pressed that down. That finishes the card for today. 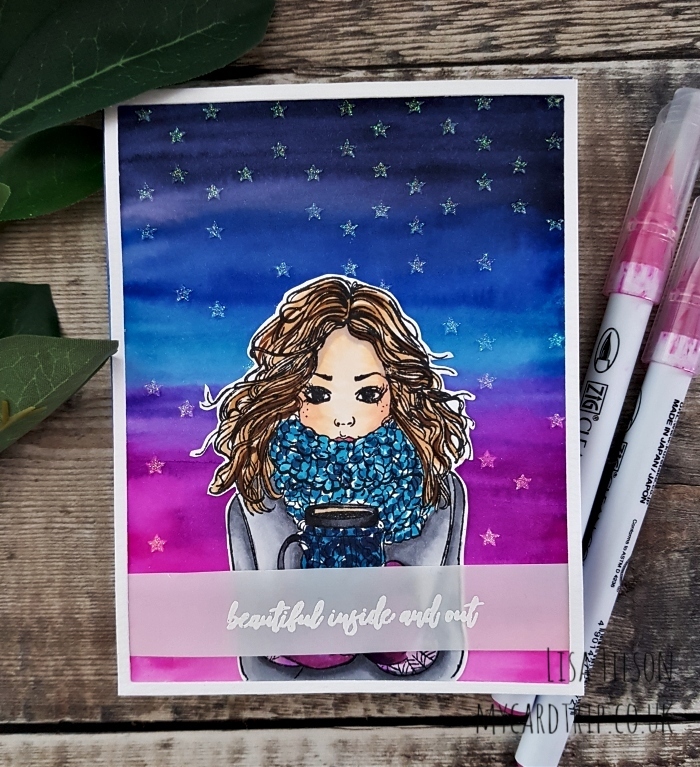 I really did enjoy colouring her but I think she may well be my last winter card until later on in the year. Don’t hold me to that though! 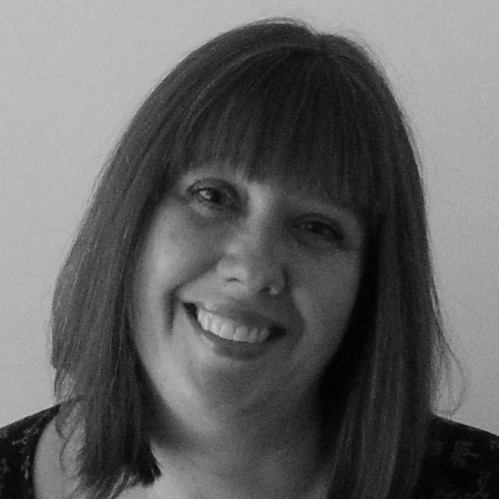 Thank you for your visit today, I wish you a wonderful Wednesday and hope you can get your craft on this week. Have a great day! Zigs: Deep Blue, Blue, Persian Blue, Violet, Purple, Dark Pink, Pink. Great card. Love the stamp set. The colours are gorgeous. I think I have to get this stamp set. Thank you for the great tips.